Axalta Coating Systems has recently opened a new training facility in Bentley, Perth, Australia. The centre will become the key training destination for refinishers from the Western Australian region, focusing on Axalta’s refinish and industrial products, to help maximise refinishers’ skill-sets and keep them up-to-date with latest technology and techniques. The new training centre, was initiated to help customers and business partners in Western Australia avoid having to travel vast distances, often up to 4,000km. It provides easy access to world class product and consultancy training programs that will address business and product requirements, sharpening customers’ competitive edge. Located south of Perth, on the premises of Axalta distributor Global Autocoat, the 400m2 training centre is equipped with state-of-the-art equipment, tools and layout. It has two training rooms with the latest audio/visual equipment, two mixing rooms, a functional production planning room, two dry sanding floors and an adjoining colour study. There are also two spray booths, one down draft and one down draft with GAS IR Arch, with full-length glass walls to optimise the un-restrictive viewing capability for training application techniques and demonstration, as well as the latest waterborne drying technology. 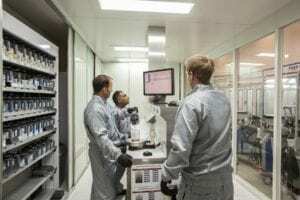 They also include special climate control settings so training can replicate varying temperature conditions commonly found in the different regions of Western Australia. The training centre also has dedicated, branded signage at every step of the repair process to ensure a smooth workflow and maximum productivity during training. And a large flat screen monitor in the mixing room allows trainees to follow the step-by-step mixing process easily, no matter where they are standing. 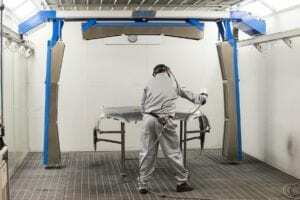 “By providing advance training techniques of our refinish and industrial brands – Standox®, Spies Hecker®, Cromax® and Nason®® Industrial – we will ensure the best usage and application of our products, colour tools, and the latest in coating technologies, including waterborne basecoats,” Polverino added. 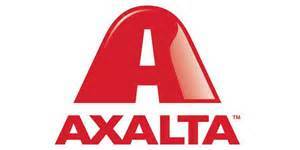 For more information on training, or to book a training course please go to www.axalta.com.au or call 1800 292 582.